On the 25th February 2009, RuneScape received another Distraction and Diversion. This time, a Leprechaun needs your help. At first, he will ask you to help a sapling grow, which he did not know would become an Evil Tree. The aim of this Distraction and Diversion is simple. Nurture the tree. Chop the tree. Burn the tree. Do so successfully and you may get rewarded. Note: Elder Trees, when felled, will yield Yew, Magic, Teak or Mahogany logs. 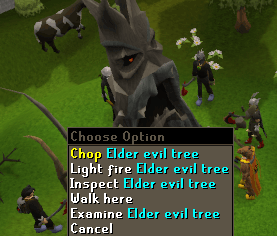 Completion of thisTree Gnome Village Quest will make your task of finding Evil Trees much easier. It is also recommended to have a Hatchet and Tinderbox at the ready, as well as four free inventory spaces for the rewards. To start, gather your Hatchet and Tinderbox. If you have not got any, don't worry, a Leprechaun at the location can give you some for free. 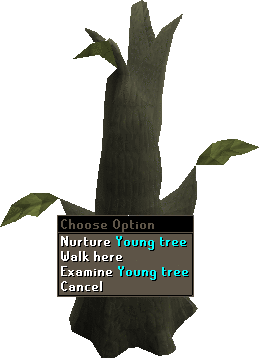 If it's just a sapling, he will give you a clue to it's location, for example, growing near Draynor he may say "Near a town of Willows". If it's fully grown, he will offer a free teleport there. Once there, should you need any equipment, talk to the Leprechaun. He will happily supply you with either a Bronze Axe or Tinderbox. When you find a Sapling, you simply need to nurture it. This is incredibly simple, but will require a certain farming level, depending on the tree type. See the table above for more information. To nurture a tree, simply click on it. You will receive Farming experience for doing so. You only need do this until it is fully grown and becomes... EVIL! When a tree is fully grown, if you're not already there, a Spirit Tree will now teleport you there. No matter how you get there, you should now be at the tree. Cut the tree. If you don't already have some, an axe and tinderbox can be obtained from the Leprechaun. 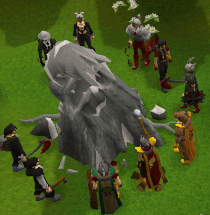 Whilst cutting the tree, you may be thrown aside by some Evil Roots. Cut these. When the roots have been chopped down, you may receive some Kindling. Use these on the Evil Tree to light it. It is recommended you make a circle of flames all around the Evil Tree. Now just cut away at the tree. To find out how much more is left to go, right click the tree and choose 'Inspect'. It will tell you the type of tree and how much health it has left. On the Health screen, it may say how much of the reward you have earned. It is possible to earn 100%. There are 26 possible locations at which an Evil Tree can spawn. By using a clue from a Spirit Tree, you can narrow it down even more! Below is a list of all locations. Of course, what would a good Distraction and Diversion be without good rewards? Well, depending on how much you contribute depends on the rewards you can receive. Obviously, the more you contribute to the tree, the significantly better your rewards can be. As well as these rewards, the Leprechaun will enhance you for a certain length of time to be able to automatically bank logs when you have a full inventory of them. It works for only Normal, Oak, Willow, Maple, Yew and Magic Logs.